The JJBS Woodland Cemetery is now nearly seven years old and proving to be more popular than originally expected. It provides a natural environment where the surroundings are planted with British native trees and plants to provide a green environment and graves are marked with a simple memorial rather than a large stone tombstone. 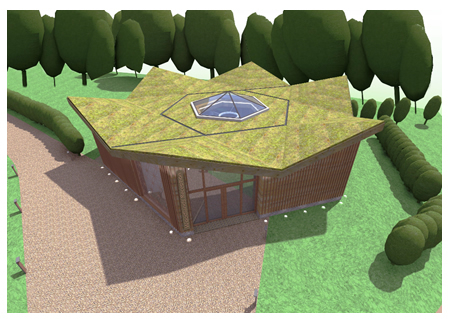 A beautiful wood-clad ohel (prayer hall) has been in use for three years and an environmental friendly gathering hall is planned where families can meet before or after an interment or stone-setting. It will also provide an on-site office for the JJBS staff. Over 120 funerals have been conducted and 15 urns of ashes have been interred in the columbarium. The Governors of JJBs have recently been discussing the management of the Woodland Cemetery and have come up with new guidelines to ensure that it maintains our ecological goals while providing a setting which meets the needs of families when burying their loved ones. Graves may be left naturally with meadow grass or may be planted with native British woodland plants. JJBS is responsible for the overall maintenance of the Woodland Cemetery and the planting of trees around the copses of graves but planting and maintenance of individual graves is the responsibility of the family. When you choose a woodland burial (either in advance or at the time of death) families are given the option of the type of areas where they wish to be buried. To maintain the natural look, the guidelines specify how the graves may be planted and what unsuitable items are not allowed. If you wish to consider a woodland burial, do visit the Woodland Cemetery to see how it looks and the choices available. You may wish to discuss your choice with your family and Rabbi and the JJBS staff will be happy to answer your questions and offer advice. More details are available on the JJBS website or call the JJBS office on 020 8989 5252.